V and I made colorful matching mama & kiddo bracelets OUT OF POPSICLE STICKS! What’s that you say – popsicle sticks?! Oh yeah! I saw these beautiful colorful bracelets created with markers here. 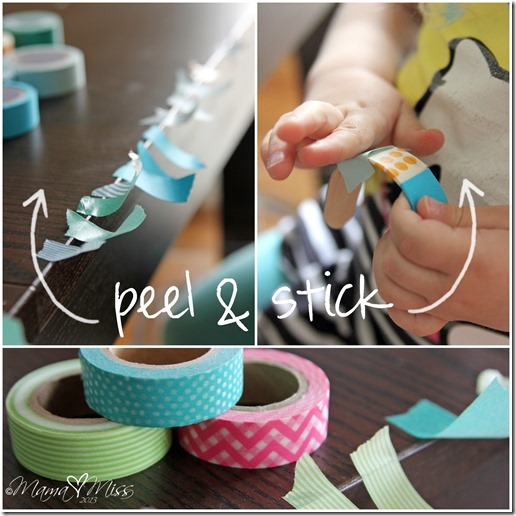 And I thought…hmmm washi tape! 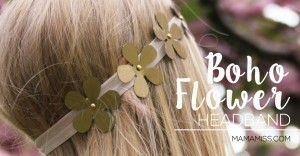 Granted these take a couple of days to make, but once the sticks are formed all that’s left is decorating them – oh and wearing them of course :) A simple and easy craft for some mama-kiddo bonding time! Start off by soaking the popsicle sticks in water, immersed fully, for at least TWO DAYS, until they are pliable enough to mold. I added a ceramic plate on top to keep them down, because they will float to the top. After a couple of days soaking, pull them out of the water and begin carefully molding them into a bracelet shape. You may want to do this process fast, but don’t. Bend them slowly, because they will break – I broke THREE! 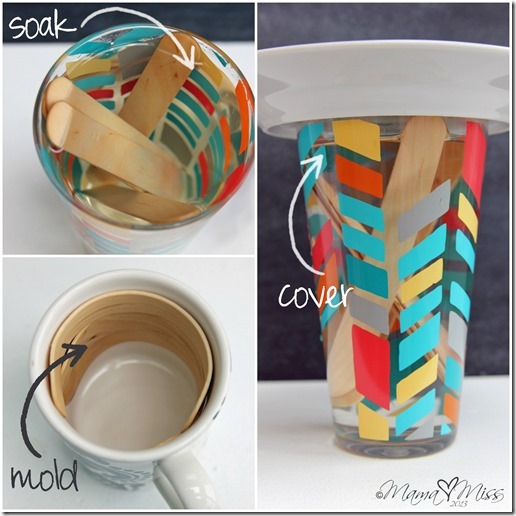 Place the molded sticks in your mug (one that is the right width to fit your wrist). Next, is more waiting. One day is sufficient drying time if the mug is placed in the sun, otherwise it must dry for two days to mold fully. 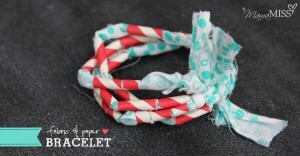 Now, the FUN part – decorating your bracelets! 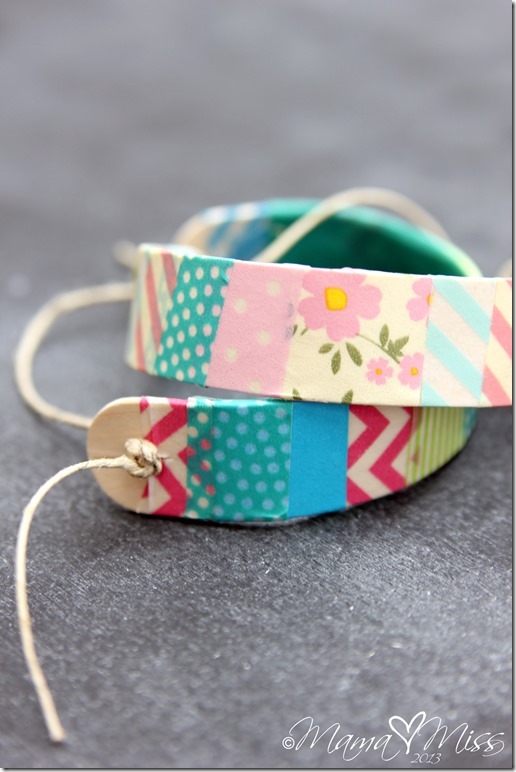 Wrap the washi tape around the bracelet using approximately two inch strips to go all the way around, leaving room at the end. 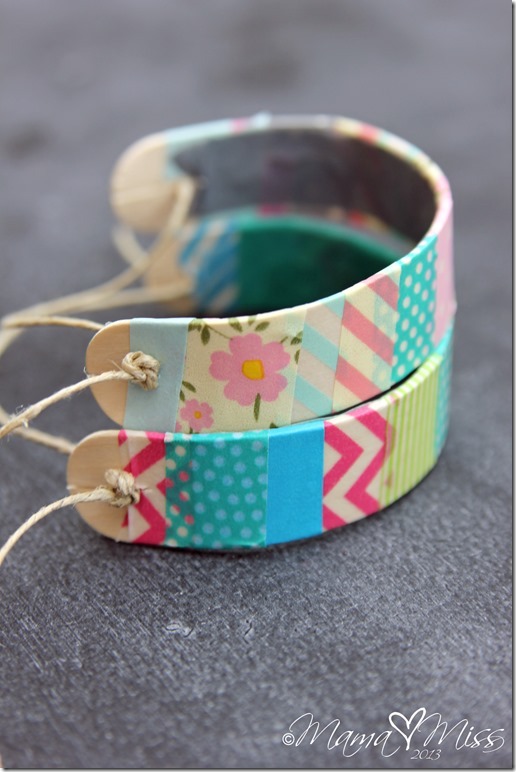 What helped V a lot was ripping off several strips of washi tape at a time, and placing them on the table for her to add to her bracelet in the order she wanted. Once finished wrapping, cut off one long strip covering up and enclosing the loose closures on the inner band, making a seamless inside. Using your awl, pierce holes into both ends, it’s okay that it cracks, this makes it easier to pull the cord through. Pull the cord through the slot and make a knot on the outside securing the cord. 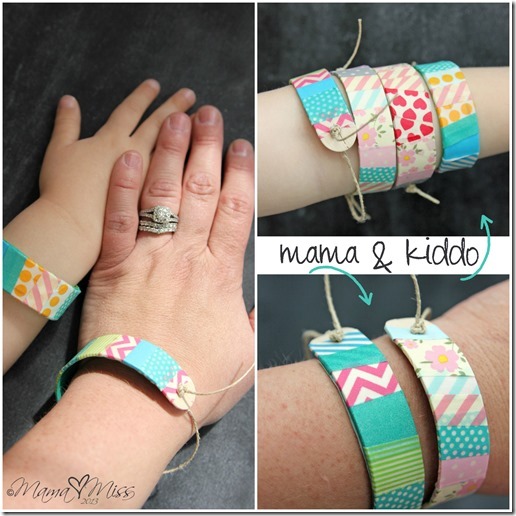 And there you have it, some pretty little DIY mama & kiddo bracelets! 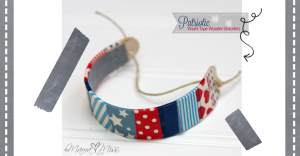 Looking for more things to make with Washi Tape?! Well, I got ya covered with a few! 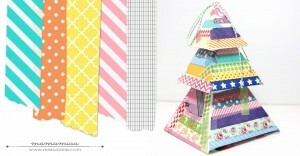 And I OF COURSE have a Pinboard on Pinterest dedicated to my Washi Tape love! 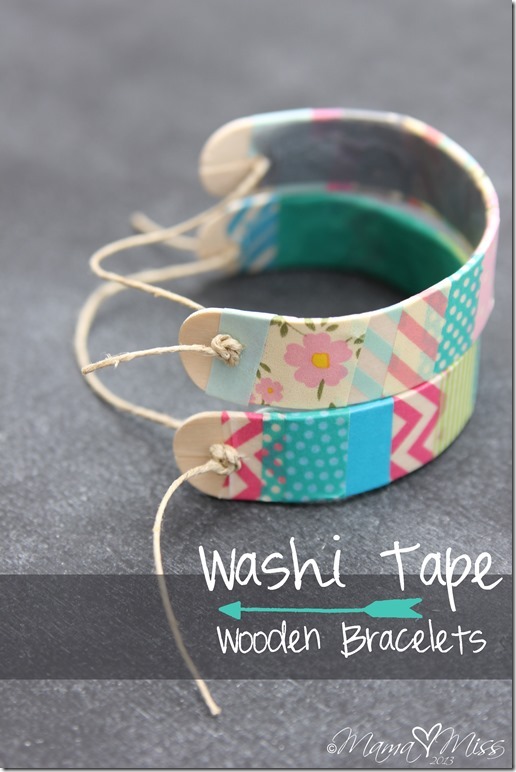 Titled very appropriately: “washi tape LOVE”! 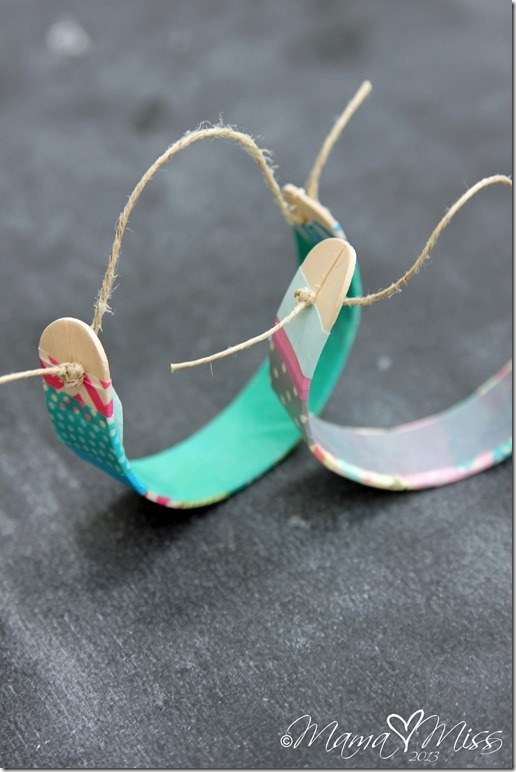 Follow me there & find some cool Washi Tape Crafts I’ve picked! Please note that affiliate links are also provided throughout the post for your convenience – to allow direct access to the products used. I love the look of these. 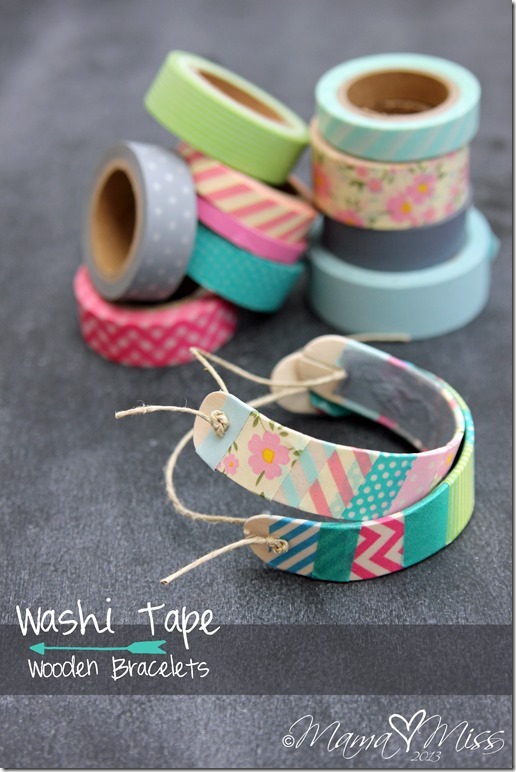 This might be a silly question but what is Washi tape? I’m in the uk. Maybe I know it by another name? 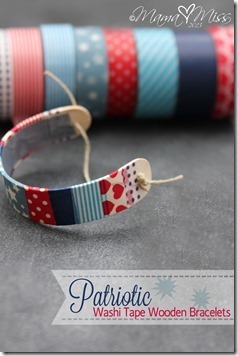 What’s the difference between patriotic washi type wooden bracelet and washi type wooden bracket ? We used boiling water, and it only needed a few hours to work. We had to keep refreshing the water to keep it hot. Cool idea! I tried to put color the water to see if it could change the popsicle stick’s color. Still waiting for results. 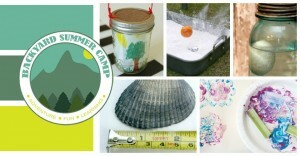 Hi, love this idea ~ think I’ll try it in our summer camp. To clarify, it looks as though one side where the string goes has a slit in it. 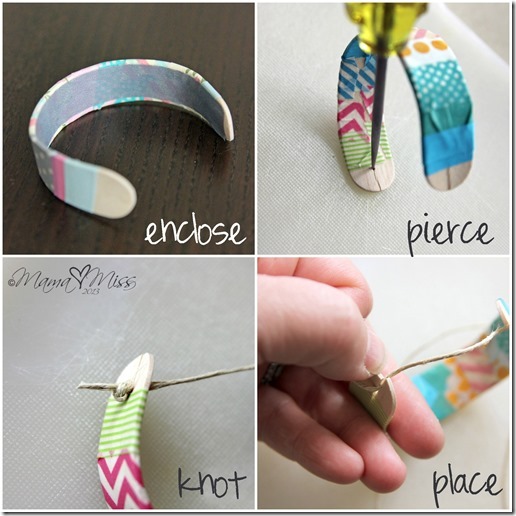 Or do you make a hole on each end to tie the knot. Thank you ! Love this idea too. 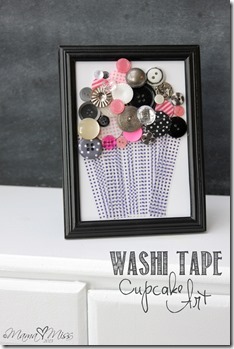 I think this could be a really different and easy Mother’s Day project for my first graders. One more question, the pics look as though you have to slide the bracelets over your hand or do you keep slipping the knot out of the crack in thebracelet to get it on and off? These bracelets are so pretty, I’ve seen them all over the place but I had no idea they were yours!! Your did such an amazing job on them. And the pictures are fantastic! Love this project! 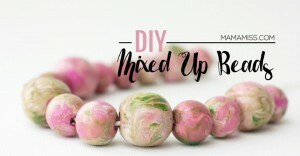 Just wanted to let you know that I featured a photo of your bracelets in my weekly round-up. It’s clearly attributed to you and linked back with photo and text links. Happy Sunday! When you said to let them soak for a couple of days, did you literally mean 2 days? We did 2 and then totally don’t feel like they’ll bend without snapping. 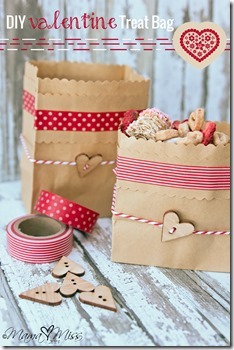 Hi, love this idea. Was it difficult to pierce the wooden sticks when they were dry – did they crack? Just wondered if you’d tried piercing them when they were wet and if this worked? You Blog is so cute! 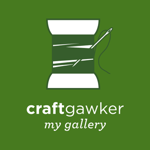 There are a lot of great ideas about crafting! 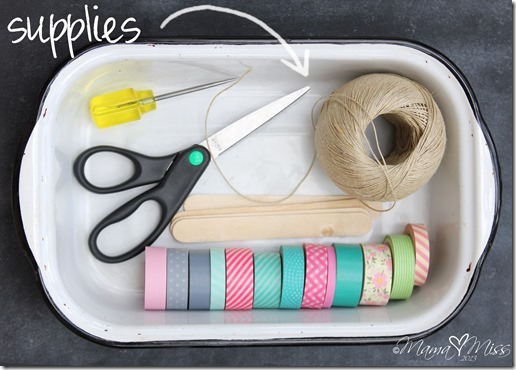 Where did you get your washi tapes? I like the one w pink Sakura flowers featured in your bracelet! I love what you make! it’s very beautiful! I love this idea! 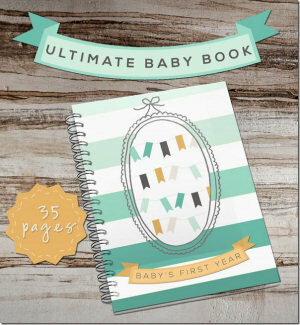 I featured this today in my “What I Bookmarked this Week” post – stop by and see! The look great! Quick question- do you think you could prevent the cracking by drilling holes in them first before soaking? I absolutely LOVE these, Melissa! 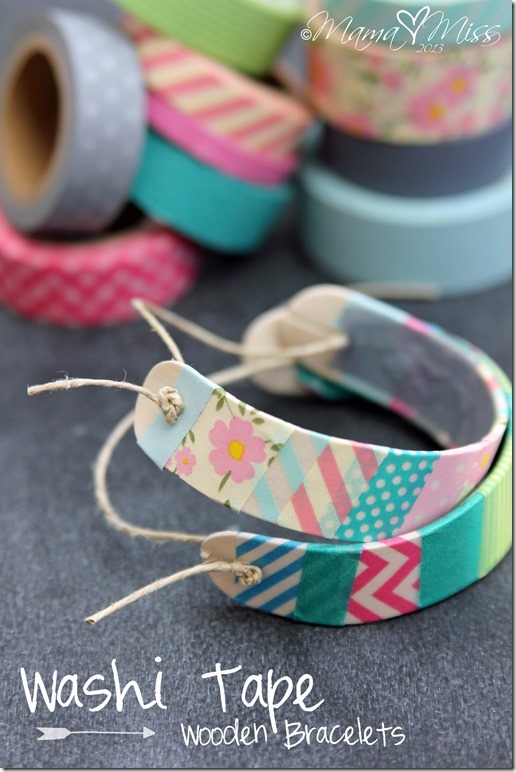 I have to get some of this Washi tape! I’m seeing it all over Pinterest. I think this is one of the coolest things I’ve seen it used for yet.